A Closer Look is a legit company. I have been a secret shopper for a few years. Some of the editors look for reasons to reject a shop. Most shops take at least an hour to write up. Blaze Pizza is the worst shops to do. I am now finding the the reward is not worth the effort. They are not scam, they are a legit company. People actually have to start getting one assignment from them and reading it. I do lots of restaurants and hotels, and it is convenient to go out and save money in turn of a report. Editors are friendly and once you make the connections with schedulers is even better. To me is one of the best companies to work for. They made me make 48 miles to review a restaurant and get $28 for the restaurant. Their website crash every time so I sent all documents by email, pictures, etc... and they said I need to get it done again on their website which does not work. CONCLUSION : I may lost 8 hours of my time and lost $28. Care to explain how they "made you" do this? I suspect that you "chose" to do this, and now you're complaining because you made a decision that turned out to not be profitable. That's not a scam. Nobody made you drive 48 miles away just to go to a restaurant. DONT take shops that are far away from you. Take shops that are conveniently close and/or somewhere that you will be anyways. I have been mystery shopping and working in the MS industry for 18 years. 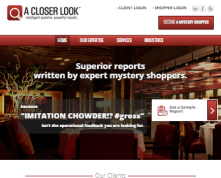 I can honestly say that A Closer Look is the best company I have worked for thus far. They have fabulous shops to offer and always pay on time. They disclose what is expected for every shop up front in full detail, and they never send an assignment unless a shopper specifically requests it. If you pay attention to details, gather the required information and submit your reports on time, you will have great success with A Closer Look and be offered excellent opportunities to evaluate high-dollar locations. The harder you work, the better the shops. I was informed I was not going to get paid bevause I did not work out at the gym for 20 min. But they got my time of getting all the information plus pictures they needed for the report. Now they have erased my history of jobs in the system. Awful! It did say in the guidelines though that it was necessary to work out for 20 minutes or you would not be paid. I have worked for them for two years now and have ALWAYS received payment from them. Sometimes they will offer to pay me more if they are in dire need of a job done in my area. I have had no problems with them and have enjoyed several nice meals out and hotel stays at no cost to me. I highly recommend this company! You should read my reply to MS expert. I was a shopper for a couple of years before that happened. I've shopped with A Closer Look for years! They are a legitimate company, always pays and pays GOOD (if you did your shop right), and has many employment opportunities to work from home with them as a scheduler or editor. My friend shops and edits for them. She makes close to $500 a month for working a few hours a day - FROM HOME (editing), and then on top of that gets most of her meals reimbursed by shopping with them! This company is a win-win! $500 a month...Wow that is very low for the industry ! I have been shopping with A Closer Look for about 3.5 years now, and it is most definitely a legitimate company. The negative reviews on this page seem to be about companies other than A Closer Look. ACL does not send out letters or perform scams. They communicate through e-mail after you are signed up to be a shopper. In most cases, you will not be paid a shopper fee for completing the shop; you are simply reimbursed for your expenses. I see it as a way to enjoy nice meals for free. You have to pay for it upfront, but you are sent a check the following month (the fourth Monday of the following month, I believe). ACL has better quality shops than competitors. It is by far my favorite company to work with. Yes, the reports require more details, but it's because they are better shops. I always pretend I'm texting so I can take all of the notes I need to successfully write my report after. A ridiculous amount of work for very little pay. I received a cheque in the mail made out to me for $2584.30. I was to cash it and use the money to rate Western Union transfers. I will be forwarding this cheque to A) the bank of Montreal (the purported bank for the cheque) and to Ontario's fraudbusters. I find it very sketchy that I have been given this cheque. Their mailer did not have my apartment number. I think this is a lure to get your bank info. When I finish with Bank of Montreal's scam department I will let you know if this is legit at all. Never give out personal or identifying info - SINS, email address etc. until you know it is valid. Was the large some of money legit? I got an assignment similar and wondering is this legit? I think I'm gonna just open an account with the check and see if it works. Any Suggestions? Just got a cheque for $1806 that they requested I go to Wetern Union with . Does seem suspicious and the cheque only had my first initial and last name. The cheque seems legit but that's a lot of money for something that can be done quite easily with $100 instead. Let me know how it worked out before I give away any banking details to this company. I want to believe.